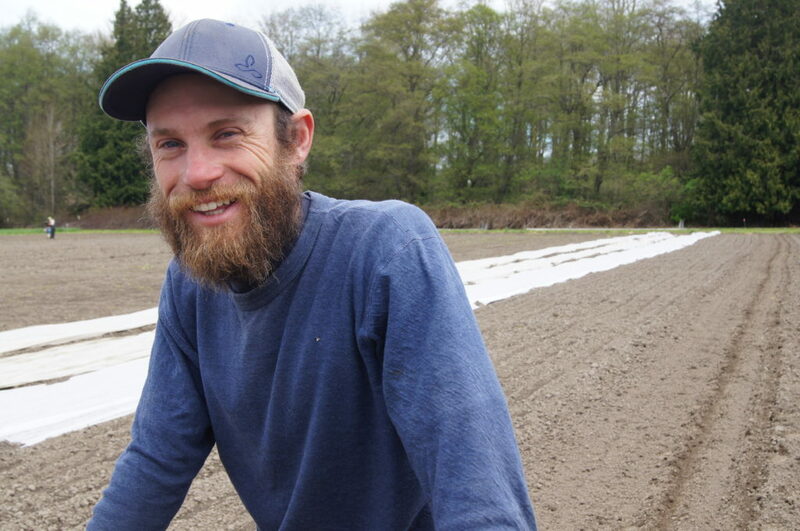 River Run Farm is an organic vegetable farm nestled at the bottom of the Olympic Mountains near Sequim. The Dungeness River snakes its way across the east side of our property. From my perch here at the kitchen table in the farmhouse I can see that most of our fields lay prepped and ready for their new charges: organic squash, lettuce, kale and other market garden favorites. 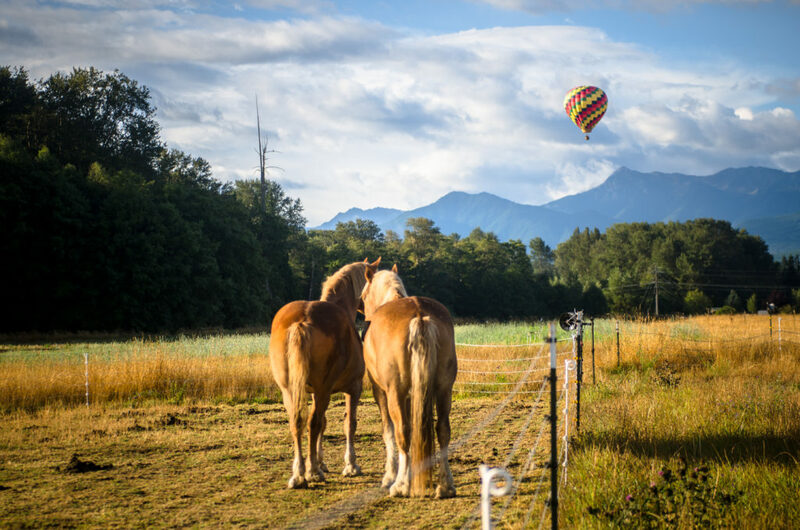 Our draft horses nibble at the fresh spring grass, getting ready for their upcoming day of plowing or harrowing. Our beets are getting thinned and our brassicas are getting hoed by someone in neon raingear—one of the new seasonal crew probably. The dandelions shared their bright yellow blaze with us, and now their seeds pirouette across the farm when the wind kicks up. Wet, transparent petals from apple blossoms stick to the technicolor grass. The hustle and bustle is increasing day by day. People and plants. Everyone is busying themselves. Summer is close. There’s a lot to do and we’re kicking ourselves, as usual, for not being more on top of our to-do lists: we’re a few weeks behind in our crop plan due to wet weather; our pack-shed still needs that deep winter clean. And it’s already May. Oh, and those pretty dandelions I mentioned? They need mowing. These days, whether you’re a farmer or a mom, it’s easy to feel like things are overwhelming, complicated, or too much. It’s easy to ask: am I doing enough? I was reminded recently that periods of chaos, of unexpected change, and disruption are precursors to transformation. Nature teaches us this lesson with her typical circuitous logic. We learn how to be boldly vulnerable like our tiny transplants. We learn to have faith that the seeds we sow will miraculously yield radishes. We learn to take raging waters as a gift like the smooth river rocks do. 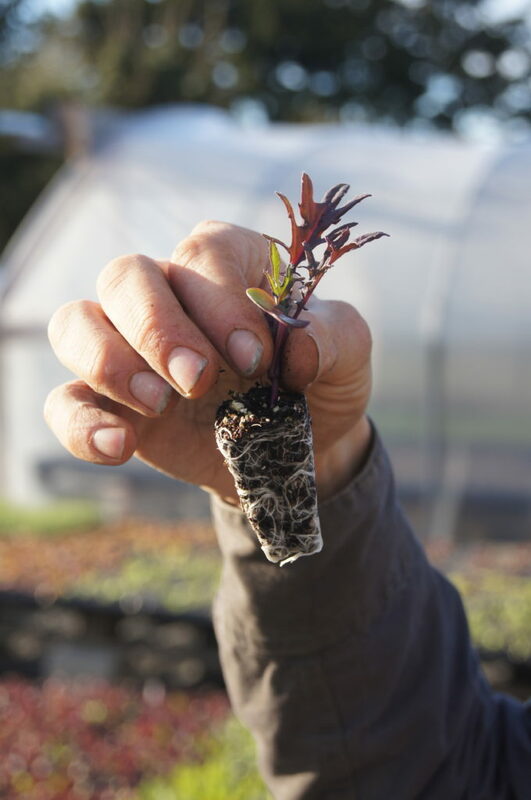 We learn resilience from our overwintered kale that just keeps going and going and going. Nevertheless, she persists. One of her best and most important lessons is gratitude. Summer means our weekly trips into Seattle are starting up again. 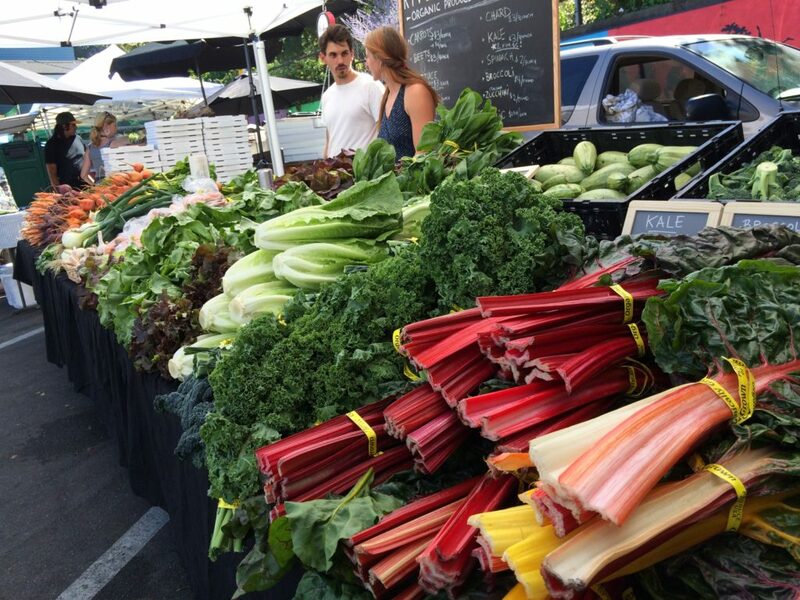 We’ll soon begin our full season Farmshare where members of the farm receive a share of our vegetables every week and the farmer’s market season has already begun. The Seattle run can get crazy, but I love the opportunity to spend time with our off-farm community. 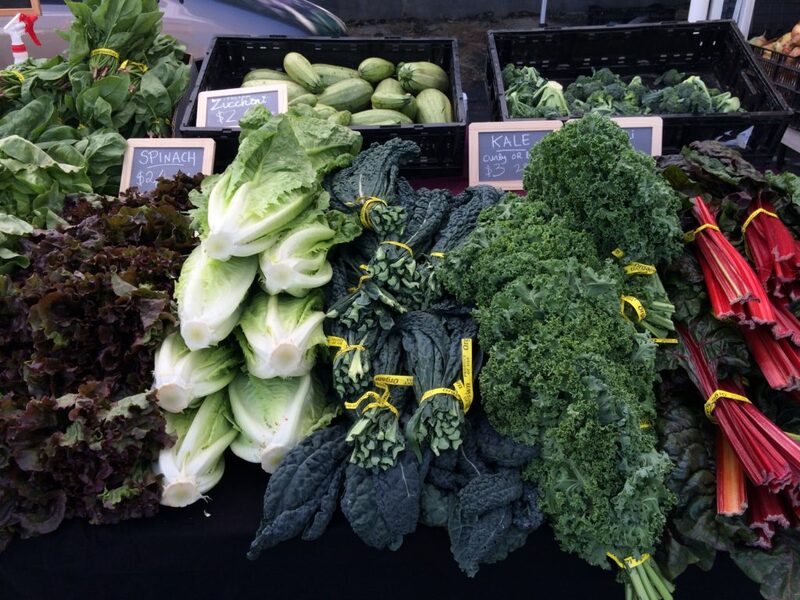 When I hand over your vegetables at market or drop off a box I get to see our hard work and perseverance pay off. 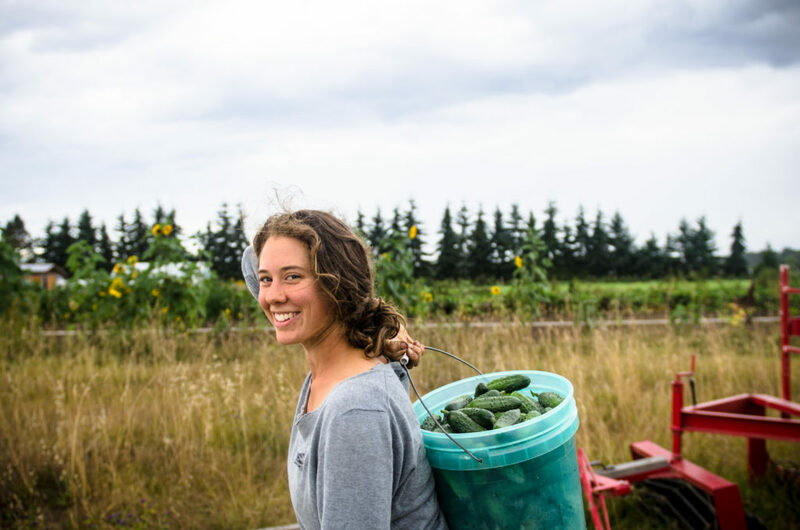 We farm because we believe that eating organic vegetables straight from the field should be easy and accessible. The moments we share may be fleeting—a quick hello, a recipe exchange. But I feel so grateful for this connection, the completion of a journey. Grower to eater. Farmer to family. Because our lives are interconnected. We feed you, and you feed us. The reciprocity is so real. Our relationship is so honest and direct. When we choose to cultivate relationships based on mutual respect, recognition, and compassion, we take those lessons of gratitude, resilience, and vulnerability and we put them into practice. I look out on our farm—wet, alive, vibrant, and full of life. I see the challenges we face, too, both on and off the farm. Are we doing enough? Yes, I think we are. Recipe: We have radishes. And they are huge. They have just the right amount of spice to them, but mostly they are so juicy and crunchy. Radishes offer up that crunch that we’ve missed for months! Ours are the size of golfballs, bigger really! 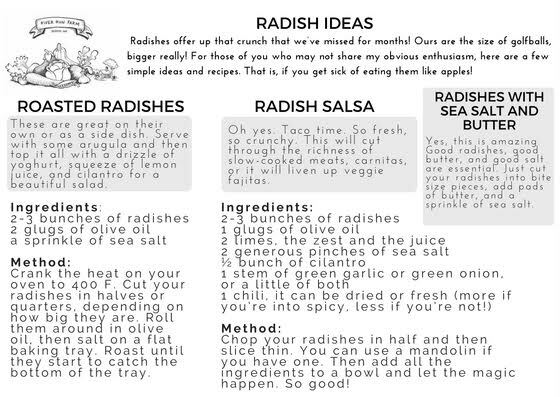 For those of you who may not share my obvious radish enthusiasm…here are a few simple ideas and recipes. That’s if you get sick of eating them straight from the bunch (or ground in our case). 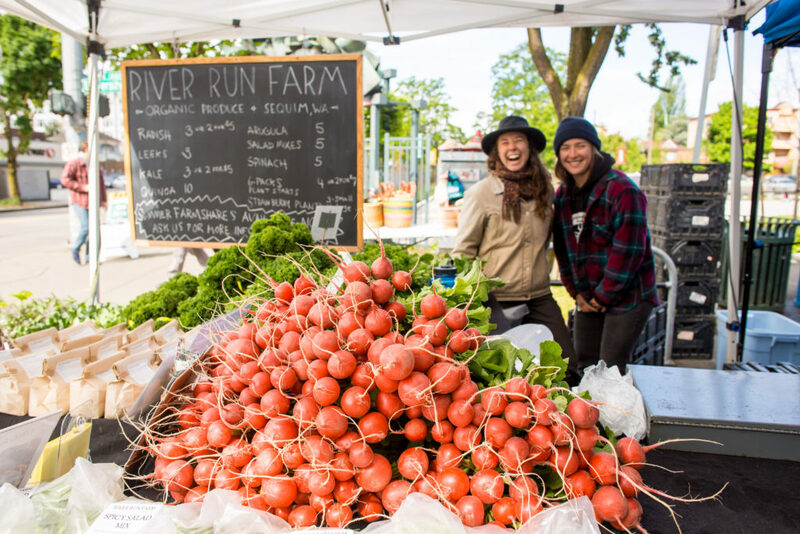 River Run Farmshare starts on June 22nd and members get a box full of organic vegetables delivered every Thursday to neighborhood pick-up points throughout Seattle. 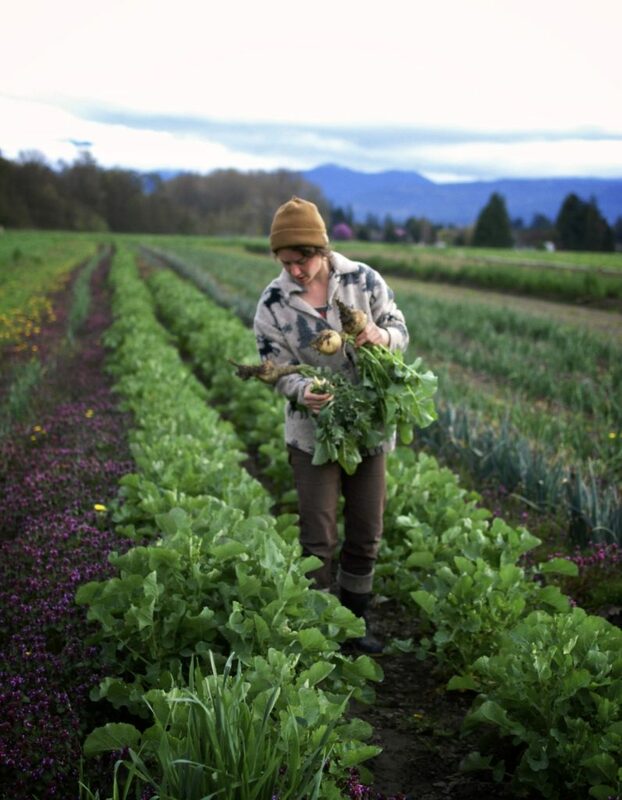 Each week, we’ll choose the best of what our fields have to offer and bring it directly to Queen Anne, Phinney, Madrona, Ballard and University District. 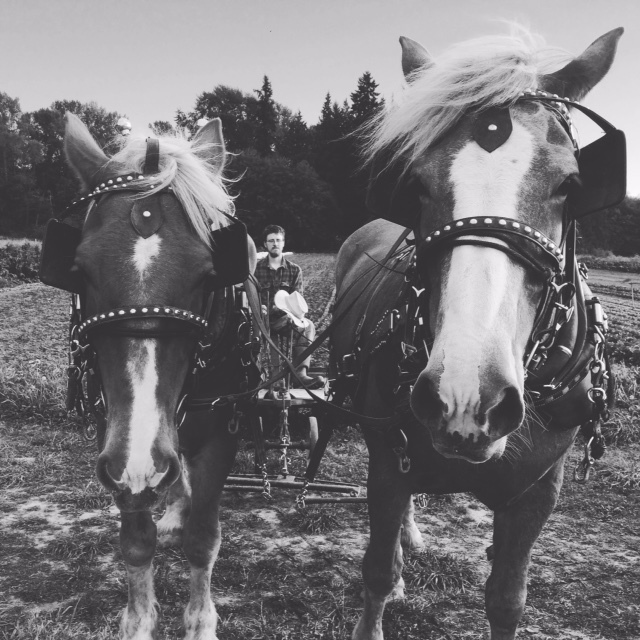 Become a member and find out more information about our farm on the website :http://riverrun.farm/farmshares-1/. 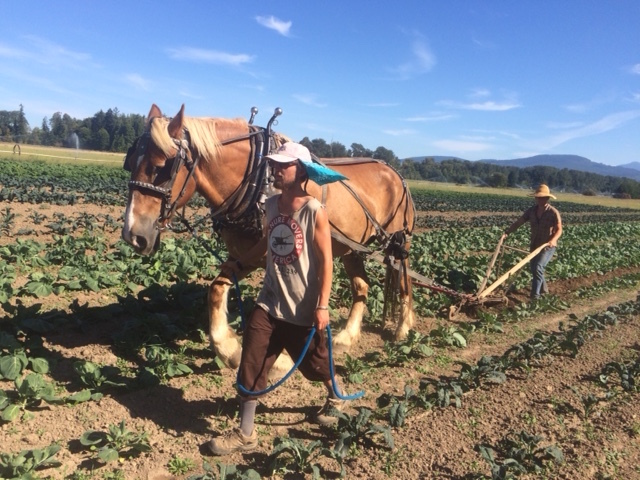 In the words of one of our 2016 Farmshare members, “I so appreciated getting such fresh, seasonal, local produce. I also very much believe in small farming and loved the opportunity to support something meaningful to me”. Looking forward to feeding you this summer! 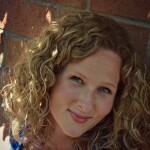 If you have any questions or concerns email Elizabeth at farmshare@riverrun.farm.